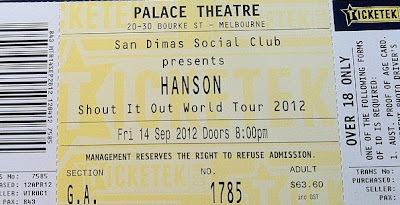 Last Friday night, I had the pleasure of seeing Hanson in concert. 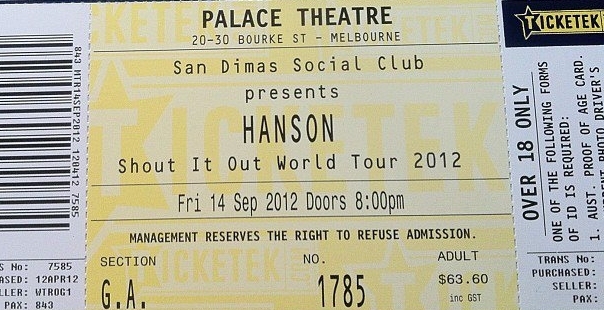 It's been seven years since they last toured Australia and, as having been a huge Hanson fan in my youth (I was sure that I was going to marry Zac - just like millions of other girls in the world =P), I couldn't pass on the opportunity to see them once more! After dinner (at the Spaghetti Tree), we headed across the road to the theatre and the line was crazy long! This was just after 8pm and I wanted to see just how far the line went. I had no idea that it would be a huge maze that circled around four corners, through dark alleyways and back onto a main street! Let me set the scene, if there hadn't been so many people, you'd imagine it would have been a popular destination for Jack the Ripper to lure in his victims. Still, I love a good line and it set the mood. There was anticipation and excitement in the air - and I was amused as every new group of people, who would journey to the back of the maze, would remark as to how long the line was after turning every corner! The opening act was an American singer called Matt Wertz. He was very very good! It was his first trip to Australia and he seemed very excitied to be there - which is always nice. It's hard for an opening act to hold peoples interests but I thought he did an amazing job. He amused me with his questions as to if we used 'twitter, facebook, itunes' etc 'down here'. Like, duh! It's so cute when people have this stereotype of us. He also suggested that when us Aussies journey to America that we should say that we're travelling 'up over' (as a play on 'down under') but he said that it could also refer to Spain and Europe so it probably wouldn't stick. He played from 9-9.45pm. 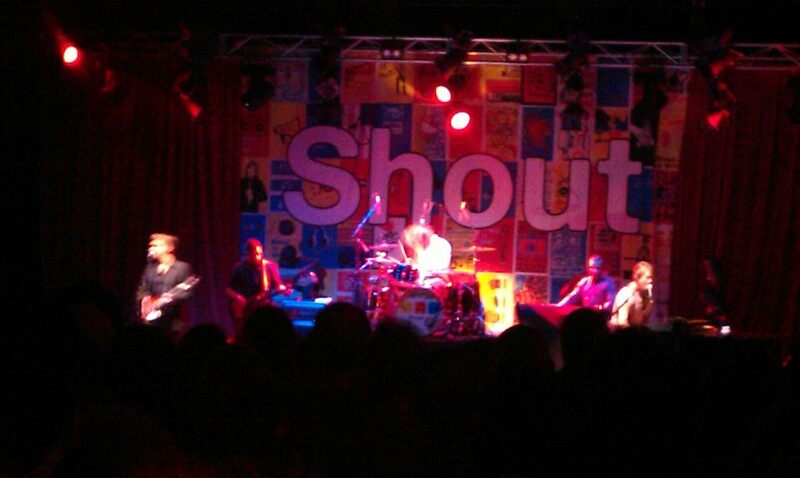 Hanson came on stage at 10.20pm and played until midnight. Zac entered the stage, followed by Isaac and lastly Taylor. I'm not 100% sure, as I was kind of near the back, but I think Ike was in a suit and, Zac a tshirt and jeans. Taylor, I know for sure, was in a long sleeved tee and jeans with braces. Mmmbop was by far the fan favourite - as you'd expect. They played it towards the end. There was more screaming and dancing - there was also an increase in phones and cameras being held up into the air for recording. The audience was asked to sing along with the chorus at one stage which made it extra special! If Only was their encore song. Taylor took centre stage with the harmonica but would race over to place his piano too. It was such a great upbeat closing song. I'm also a huge fan of this song. I will always remember it as it being their first "comeback" single, I guess you could call it, after having released their first album, Christmas album and old recordings. Taylor said something like 'now you've proven yourselves that you can make a lot of noise, but I wanna know, can you jump?' and the song band started jumping and the audience followed suit. I almost died of excitement when they sang Can't Stop. Can't Stop is my favourite Hanson song. I wanted them to sing it at the last concert but I knew that there was little chance that they would. I was so convinced that they wouldn't play it this time either but they did!!! I straight away got my camera and recorded the whole thing. They made it a little more reggae and instrumental. I loved the changes. I'm oh so grateful that they decided to play it. 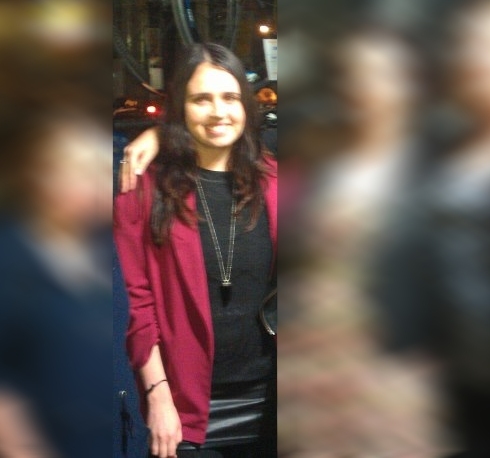 It made my night 100 times more special! And I'm pretty sure no one got as excited over that song as me - and I didn't see anyone else recording it either. Taylor explained that Penny and Me was a great song to go driving too - I know there was a long story but I can either not remember it or possibily couldn't hear what was being said. I remember Taylor telling a story about Great Divide. I know it was a song for charity but I'm really unsure as to what he said about it. I adore this song though. I haven't listened much to this album but this definitely stands out as a favourite from The Walk. I don't seem to enjoy/remember songs so well if I can't sing along to the lyrics - strange that. I was so convinced that the first song they would play would be Waiting For This but I was wrong - the first song they sang was Thinkin' About Something. The song really set the mood for it to be a fun show. They did play Waiting For This a little later and the banter for this song was explaining that they hadn't been to Australia for seven years and they'd been waiting a long time to see us. They also reministed on having sang in a car park some 15 years ago. It was their 20th anniversary being a band together and Taylor said that we were part of that celebration. Give A Little is the song that they've decided to release as their first single from the new album in Australia. Taylor said that boys are so easy to tease and play with.I think he said that the boys should listen up to the lyrics of the songs as they know some tricks us girls use. I can't remember the whole story but it was very cute. Taylor's face lit up - it was cute! Zac also sang a cover song by the Beatles. I'm unsure what it was called. I don't remember any of the lyrics and I had never heard the song before. There was also a part which was apparently first conceived in Australia when they recordered their live album here in Melbourne the last time they were here. I can't remember the song but the audience claps along to the song. As the music gets faster, so too does the clapping speed increase. There was also another song where Taylor wanted to see us clapping with our hands high up in the air. It was all in good fun - but it was bloody hot in that room! Zac kept having to wipe his face with a towel after every song. At one point, after about two-three songs, the band left the stage leaving the audience confused, as it was too early for an encore. 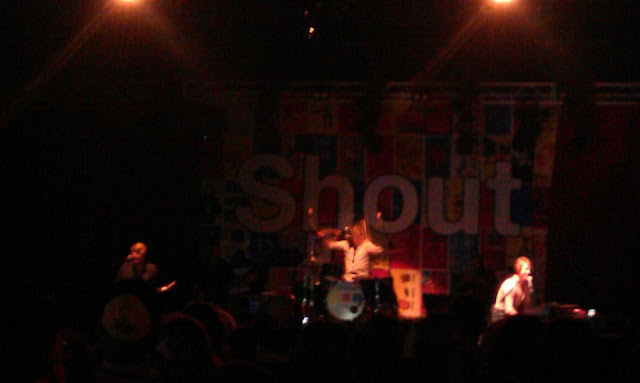 They came back on sortly after and Zac moved from his drums to a block thing (?) that he could hit (like percussion) for the next couple of songs. He moved back to his drums for the remainder of the set. Taylor them explained the great news that they would be returning to our country (hopefully soon). He sure made it sound like it would be soon (or at least that they were in talks or new dates or something). All up, it was such a great night. I'm so pleased to have had the opportunity to see them once more. I liked that they played a mix of old and new. I thought for sure that they would mostly play songs off the Shout It Out album with some random Middle of Nowhere songs thrown in the mix. But I was pleasently surprised that they managed to cover a good chunk of every album (minus The Walk). It helped make everyone have an even better time - as no matter which era of Hanson you were from, you could sing along to at least something. I ended up getting home around 2.30am - and didn't go to bed until 4am. I was on such a high!